The WEG CFW08 Plus Series is a redesign of our successful µline VFDs. Engineering improvements have produced one of the most compact and full featured microdrives in the marketplace. 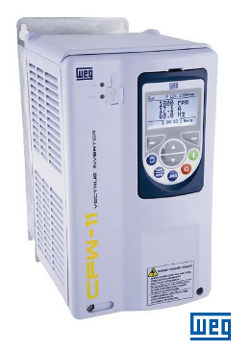 Outstanding features and options in a NEMA 1 enclosure allow the CFW08 Plus to be successfully used in a large variety of applications. 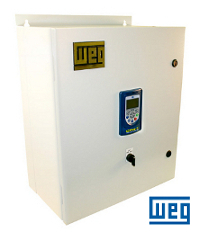 Get a THREE YEAR WARRANTY for your WEG AC Drive and Motor when you order them together! 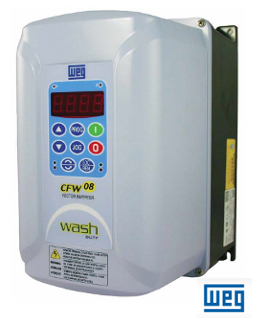 The CFW08 Washdown brings the many CFW08 design benefits with added versatility for the operations of higher protection degree environments. Get a THREE YEAR WARRANTY for your WEG AC Drive and Motor when you order them together! High technology for motors driving. 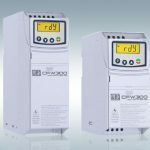 WEG VSDs offer several features like easy installation and operation, compact size and have a number of special functions. Get a THREE YEAR WARRANTY for your WEG AC Drive and Motor when you order them together! 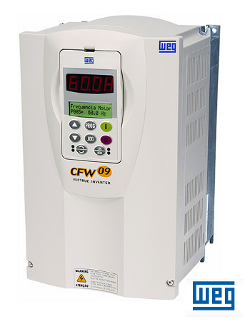 The WEG Digital CFW10 VFD Series is an offspring of the very successful CFW08 Plus. 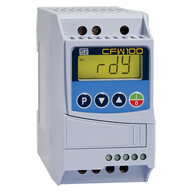 In addition to a very small, easily mounted package, simplified keypad and bright LED readout, complete diagnostics and fully programmable I/O, the CFW10 controls three phase AC motors with a single phase AC input.Get a THREE YEAR WARRANTY for your WEG AC Drive and Motor when you order them together! A new generation of frequency inverters with high-tech features built in. The CFW-11 is fitted with Plug and Play technology and can automatically recognize and set accessories and optionals. Get a THREE YEAR WARRANTY for your WEG AC Drive and Motor when you order them together! 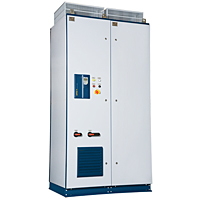 The Enclosed Drive Panel is an industrial general purpose AC motor control and protection package. It is designed for simple and quick installation and start-up, requiring only input power and output motor connections. Call for pricing and availability. The smallest volume on the market, the CFW100 is a robust product in such compact frame. The little size hides the power on your fingers, adjustable for industrial and commercial machines up to 150% of overload in 1 min.Get a THREE YEAR WARRANTY for your WEG AC Drive and Motor when you order them together! 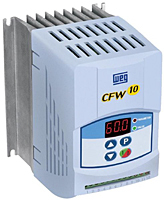 The CFW500 covers power levels from 0.18 to 7.5 kW (0.25 to 10 HP). 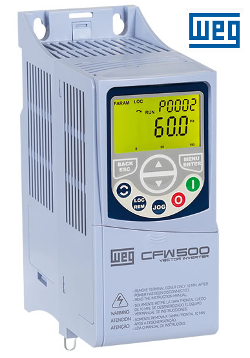 The WEG CFW500 drive has 230Vac power ratings of 1/4HP-3HP Single-Phase input; 1/4HP-15HP Three-Phase input, as well as 1/4HP-25HP 3 Phase input at 460Vac. Key features include V/Hz and vector control (VVW) operating modes, a built-in PLC, integrated keypad with back lit display, optional external flash memory module, and ‘plug and play’ option modules for communications and I/O to accommodate numerous machine configurations. The CFW700 is a lower cost version of our CFW11 drive, perfect for OEMS. It is the optimal drive for pump and fan control. The drive includes features such as built in PID controllers that can be programmed in engineering units for ease of understanding and set up. The drive also features an integrated power supply to be used with external transducers to measure flow or pressure. Get a THREE YEAR WARRANTY for your WEG AC Drive and Motor when you order them together! CFW701 HVAC-R – The HVAC-R market deserves a dedicated and complete Drive. 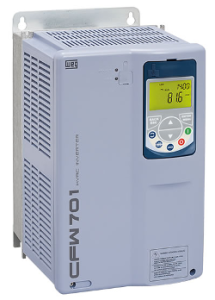 The CFW701 covers power levels from 1.1 to 132 kW (1.5 to 175 HP). The CFW701A was designed with the features and functions required for HVAC systems, with the same reliability, rubustness and energy-efficient control known in our industrial lines. New generation of WEG frequency inverters for high power ratings, ranging from 450HP-2500HP with line voltage from 380V to 690V. Custom built in the U.S.A.